Padre Island is the world’s longest barrier island. (A barrier island is a long and narrow sand island parallel to the mainland and protecting it from erosion.) Padre Island is located along the southern coast of Texas in the Gulf of Mexico, near Corpus Christi. Wind-swept sand dunes and endless beaches; unique grassland fauna and flora overlooking water, what’s not to love? While driving back from Mexico to Canada, we made a day trip to Padre Island. I had wanted to visit it for 15 years! Since we homeschool our children, it became a field trip. We learned new words like hypersalinity (the state of a unique ecosystem saltier than the ocean), coastal prairie (a rare grassland ecosystem) and biomagnification (when bigger species eat smaller species that have ingested and accumulated toxins, causing the bigger species to accumulate a greater concentration of contaminants). After being on the road for two and a half days, we needed to move and Padre Island was the perfect place to do this! The Rangers at Malaquite Visitor Center are amazing! They get the children involved in learning activities. And yes, you may touch the artifacts! We asked many questions and in return they provided information and documentations that we used for school research. It’s a paved loop, ¾ mile long, near the entrance of the park. You will find a Botanical Guide at the Malaquite Visitor Center to take along and refer to on the trail as you encounter some of the plants growing in this endangered ecosystem. 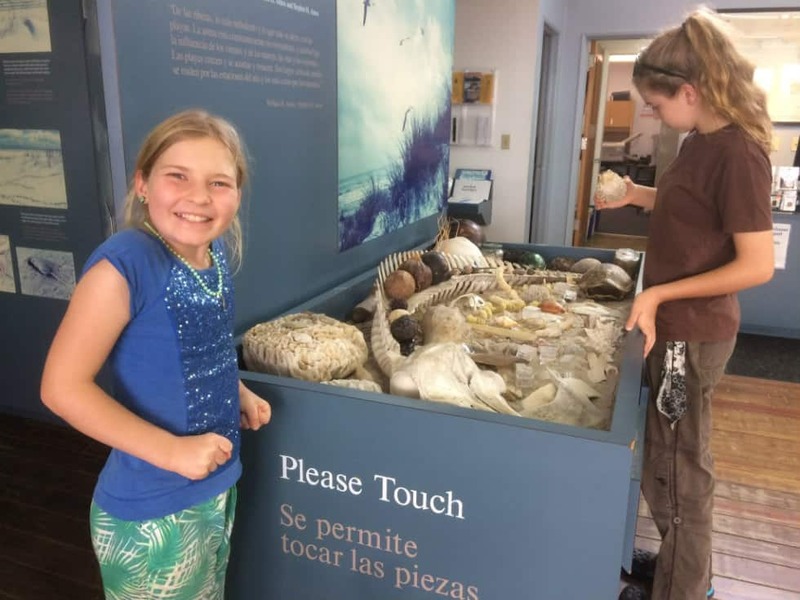 It is so much more than just picking up seashells! It’s a great place to run barefoot too! On our walk on the beach, we learned about sea beans (seeds that float ashore), sea whip (a type of soft coral that washes ashore and looks like yellow, wiry seaweed), and wrack line (the line created by the debris that was washed in by the tide). You can get garbage bags at the Malaquite Visitor Center and you can pick as much trash as you want. There are always small plastic bits washed up by the tides. When the children bring back their bag to the Center, they will receive a special badge! 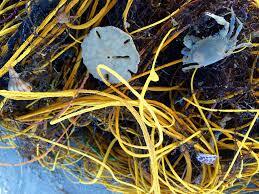 It is a fantastic way to get the kids motivated to keep the beach clean. If you have the whole day ahead of you or are planning to spend a few days, here are more options of fun things to do. 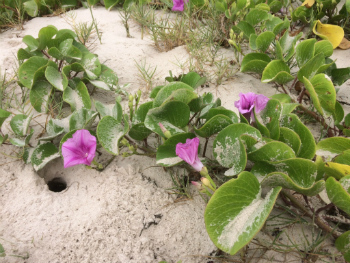 They are a wealth of information and if they see you are interested in learning, they will go the extra mile to make sure your visit at Padre Island National Seashore is an unforgettable experience. You will find the Rangers at the Malaquite Visitor Center. They happen in the months of June through August. To ensure to see one, visit the park’s website. (www.nps.gov/hatchlingreleases) Pick a date when several nests are due to hatch. 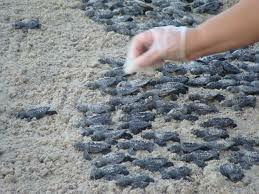 Be familiar with the many guidelines for public hatchlings releases to promote a safe and successful journey for the turtles. If you have a high-clearance, four-wheel drive vehicle, plenty of gas and the appropriate equipment in case of emergency, you can drive south along the beach for 60 miles (96.5 kilometres). It makes for an exciting discovery adventure! Be sure to get a map and some instructions at the Malaquite Visitor Center. There are several hundred bird species to observe at all times of the year, but especially during the winter migratory season. You can sign up for a Bird Tour from November to March or April. You will need a permit to camp within the park. You can find them at the entrance to each campground. Some sites are suitable for RVs but there is no electric, water or sewer hookup. There is a free RV dump station and potable water filing station available for all visitors near the entrance of the Malaquite Campground. All sites are on a first come, first served basis. As a parent, safety is always a priority when visiting an unknown area. Here are some safety tips to make your visit to Padre Island fun and keep your family out of harm’s way. They could happen occasionally. If you are caught in one, do NOT fight against it. Swim parallel to the shore until you break free from the current, then make it for shore. Never swim alone. 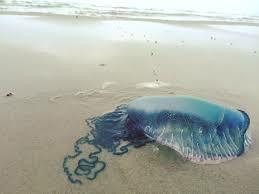 Even when dead, a jellyfish can inflict a painful sting. If unfamiliar with what they look like, stay away from any clear to bluish tinge, gelatinous mass or what can appear as an inflated Ziploc bag. If stung, you can apply vinegar or hot water. Our kids prefer sea water. It seems to do the trick for them. 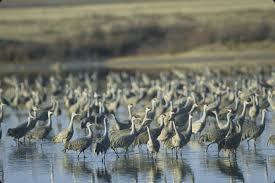 To avoid them, stay out of the dunes, grasslands and mudflats. If you need to call 911, it is recommended to climb on top of a dune for better reception. First aid can be found at Malaquite Visitor Center. But don’t let that deter you from visiting this beautiful park! Even though it was windy and overcast on the day we went, we had a blast! We learned so much and the Rangers were incredibly helpful and friendly. We would like to go again with more time for more fun and exploring. 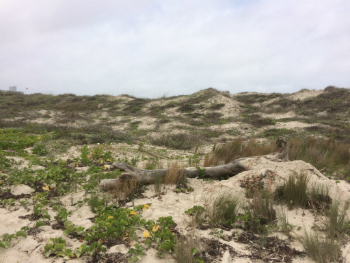 Visit Padre Island National Seashore for an afternoon, a day or a whole week! Be respectful and help preserve this unique environment so that many more families can enjoy it.